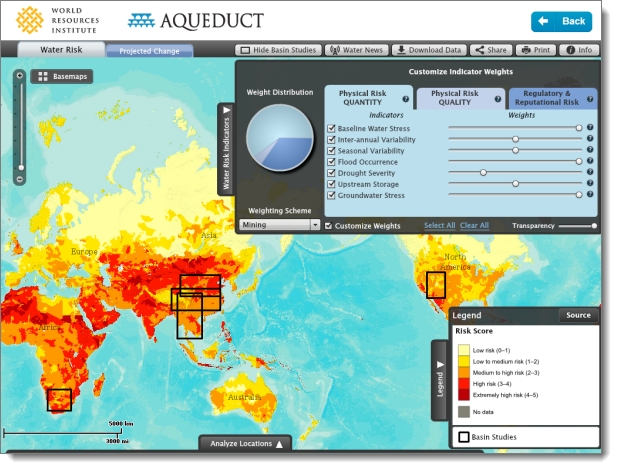 Blue Raster and the World Resources Institute (WRI) recently launched the latest version of Aqueduct Atlas, helping businesses around the world understand the impacts of a sustainable water supply. The platform creates customizable, multi-variable maps that display twelve indicators of water risk in a given area, including groundwater stress levels, drought intensity, and flood occurrence. It also considers less obvious risks like legislation and regulatory limits to water access. To map their priorities, users can adjust the weight of the water risk variables. The maps also have settings for nine water-intense industry sectors, including energy, agriculture, and chemical. Geocoding allows users to plot facilities, suppliers, and potential new market locations. Built on ArcGIS Server 10.1, the tool takes advantage of the new “dynamic layers” capability to allow rapid rendering of more than 25,000 polygons to depict the topology of catchment areas. Aqueduct has received extensive media coverage, including in the New York Times, The Guardian, Fast Company, Bloomberg, and Greenbiz. Aqueduct allows users to easily see water risk around the world. Come check out this new decision-support tool.